Zoltán Kész celebrates his victory in the February, 2015 Veszprém by-election (photo: Magyar Nemzet). On February 22, 2015, opposition-supported independent candidate Zoltán Kész won a by-election held in the city of Veszprém (west-central Hungary, pop. 61,000) and surrounding communities to fill the National Assembly seat that former Minister of Public Administration and Justice Tibor Navracsics vacated following his appointment to the European Commission. Kész won the election with 42.6 percent of the vote, defeating his Fidesz–Christian Democratic People’s Party (KDNP) rival, runner-up Lajos Némedi, by nearly 11 percentage points (source in Hungarian). The independent candidate’s victory deprived the Fidesz-KDNP alliance of the two-thirds majority it has commanded in the National Assembly since 2010. This supermajority has enabled Fidesz-KDNP to unilaterally transform Hungary’s legal landscape over the past five years through the adoption of a new Fundamental Law to replace the former constitution and the amendment of Cardinal Laws. Fidesz-KDNP candidate Némedi received 11,113 votes in the February 2015 by-election, down from the 22,194 votes that Fidesz-KDNP candidate Narvracsics received in the regular election held in April 2014 (source in Hungarian). Fidesz-KDNP therefore lost the active support of about 15 percent of the 73,674 eligible voters in Veszprém County Electoral District No. 1 in the intervening ten and a half months—compared to just under 10 percent of the eligible voters in the district who voted in the April 2014 regular election, but did not participate in the February 2015 by-election. 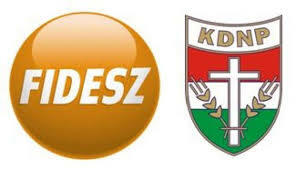 The Fidesz-KDNP National Assembly alliance: end of the two-thirds majority. This decline has also been reflected in data from Hungary’s four major independent polling companies showing that Fidesz-KDNP’s support has fallen from between 39 and 33 percent of voters in May 2014 to between 27 percent and 21 percent of voters in January and February 2015 (source in Hungarian). With the apparent failure of the policy that propelled Fidesz-KDNP to its landslide National Assembly election victories in 2010 and 2014―reorientation of Hungary from Western free-market capitalism and liberal democracy toward Eastern state-controlled capitalism and illiberal democracy―the governing party-alliance is going to have difficulty finding the means of halting the gradual erosion in support that culminated in its decisive electoral defeat in the February 2015 by-election. With the loss of its two-thirds supermajority, Fidesz-KDNP will no longer be able to amend the Fundamental Law and Cardinal Laws without support from the opposition, nor will the party-alliance be able to unilaterally elect the four Constitutional Court members whose mandates expire over the next 14 months until April 2016 (source in Hungarian). Prime Minister Viktor Orbán has stated that Fidesz-KDNP has already approved its entire agenda of laws and appointments that require the support of two-thirds of representatives in the National Assembly and therefore no longer needs the legislative supermajority (source in Hungarian). While the prime minister’s statement might be an exaggeration intended to soften the blow of losing the long-held two-thirds majority, it supports the premise that the most significant foreseeable task of the Fidesz-KDNP governing alliance does not require this supermajority: the election¹ of Orbán to serve as president of Hungary when the five-year mandate of current head-of-state János Áder expires in mid-2017. ¹The National Assembly elects presidents directly every five years by a two-thirds majority in the first round of voting and by an absolute majority in the second round of voting if no candidate receives the supermajority of votes in the first round.